In a medium bowl, blend raisins, pineapple, mayonnaise and yoghurt. Chill for 20 minutes. Place lettuce leaves on 4 bread slices. 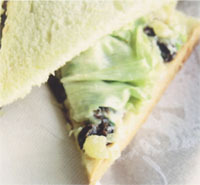 Spread pineapple-raisin mixture over lettuce. Sprinkle scallion if desired. Top with the remaining bread slices and serve.